Are your kids looking for a boot that offers an incredible first touch, awesome control, improved comfort and a deadly finish? 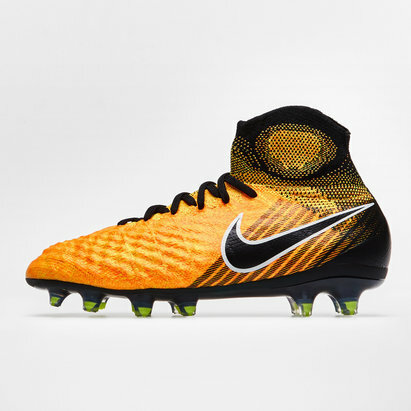 Then pull on these Nike Mercurial Superfly V Kids Dynamic Fit FG Football Boots in Laser Orange, Black, White and Volt. The new speed-ribs placed across the upper of the boot improves ball control and touch at speed. Additionally, the sole plate of the Nike Mercurial Superfly V have been completely reworked compared to that of their predecessors, including an all-new stud layout. Nike's Grip System combines to provide a locked-down fit and the Flyknit yarns integrate areas of stretch, support and breathability for a second-skin fit. The design also includes an EVA sock liner for cushioning to help relieve stud pressure. Made for the outside backs and flying wingers looking to have their say on the game with dominating pace and skill.